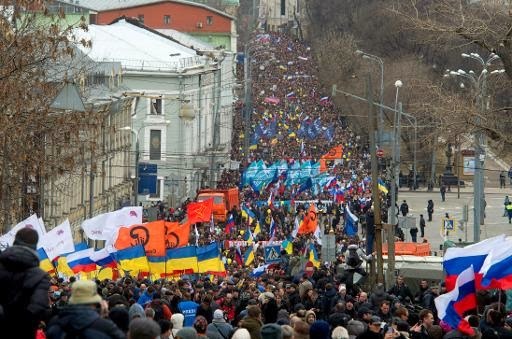 Moscow — Around 50,000 people rallied in central Moscow Saturday in protest at Russia's intervention in Ukraine, a day before the Crimean peninsula votes on switching to Kremlin rule. Many of the protesters adopted the chants and slogans of Ukraine's popular uprising that ousted President Viktor Yanukovych last month. University professor Yelena Orlova, 47, whose sign read "Ukraine is a sovereign state", said she did not expect the rally would change her government's position, but believed it was her duty to speak out. "I don't agree with the policy of Putin," she told AFP. 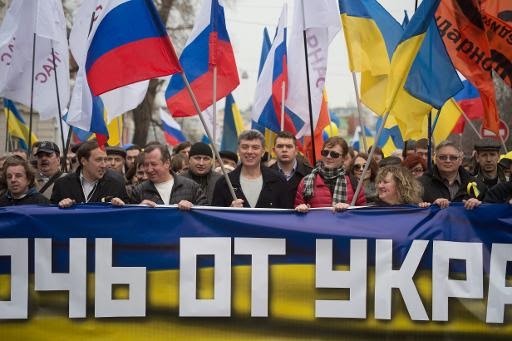 "I am against the annexation of Crimea. I think Russia should respect the borders of Ukraine." "We are patriots and Putin is Russia's enemy," activist Ilya Yashin said from the stage. A helicopter buzzed overhead as some chanted "The main enemy is in the Kremlin. No to fascism, no to imperialism." 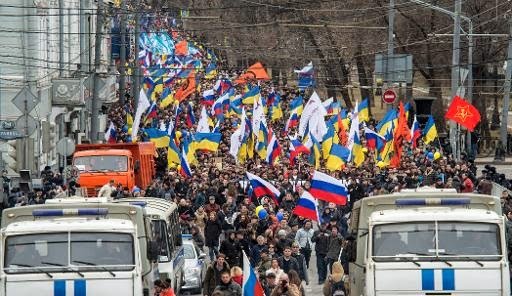 Days after Europe-leaning activists toppled the Moscow-approved government in Kiev last month, thousands of pro-Russian gunmen took control of Crimea, home to Russia's Black Sea fleet.